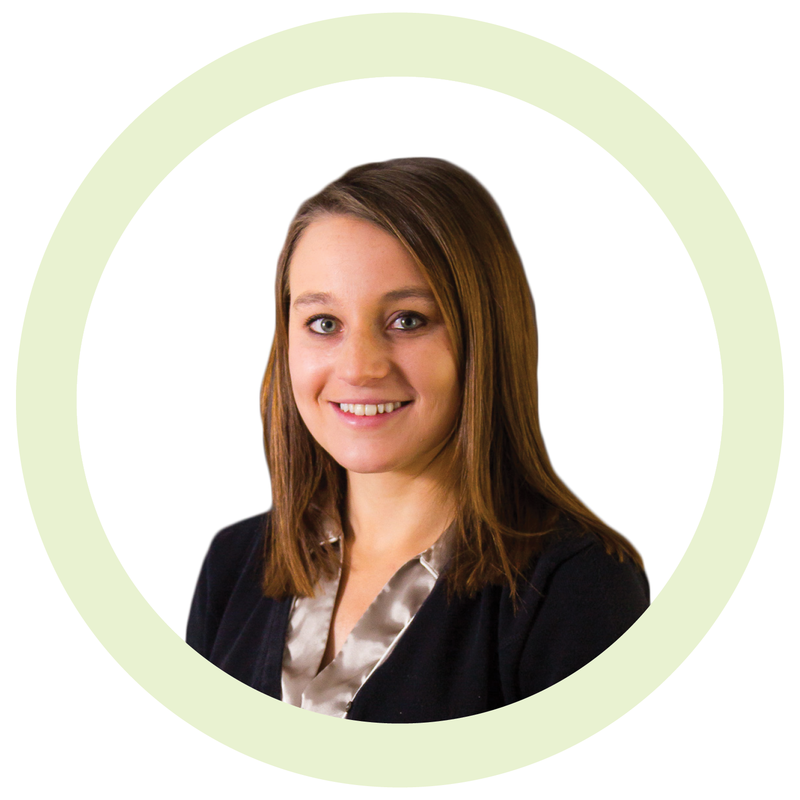 Once the contract is finalized and Procurement steps out of the process, how can the contracted terms continue to be visible and enforced by the organization? The answer is through contract compliance. This has been an elusive goal for many organizations. Contract compliance bridges the gap between what the company expects to see on an invoice and the reality once the cycle has finished. 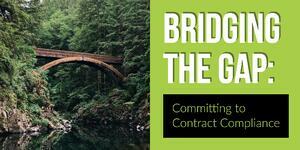 It is the bridge between Strategic Sourcing and Operational Savings. This blog will discuss why companies consistently struggle in this area, how technology solutions work, and why your organization should invest in contract compliance technology. Manual Processes. Many organizations are still finalizing contracts, printing out the information and storing it away in a file cabinet. Even if the contracts are emailed to the organization, most of them are still not visible or easily accessible to the individuals purchasing against them. It’s understandable then to see how an associate may not take advantage of a discount, as they simply do not have a way to find it. Poor Communication. While communication is key, many organizations are unable to target the appropriate business units and associates responsible for the individual purchases in an effective manner. Companies can have hundreds of contracts and different contracts can impact many groups within the business. It is easy to see how this valuable information does not make it to the right people. Organizations are global. Depending on the size of your organization, you may be attempting to enforce pricing and terms across several regions and even countries. It can sometimes be challenging enough to compel associates in a single office to purchase the same way, let alone throughout the world. As mentioned above, enforcing contract terms has always been a large obstacle. What have companies attempted in the past to mediate this hurdle? Online File-Share systems. Organizations post the contract terms and pricing information on a central online platform that is accessible throughout the company. While this can be helpful for reference, it does not force compliance when the transaction is made. It is then the associates’ individual responsibility to review the file-share information when purchasing. Identifying instances of non-compliance internally and correcting. Organizations perform internal analysis on historical data to validate if a supplier did not accurately invoice as outlined in their contract. This approach is reactive and often incurs higher costs than the benefits identified. Third party audits. Organizations can opt to hire a 3rd party company to assess large volumes of invoices compared to the contractual terms. While this activity may identify a potential large amount of money due to the organization, failed attempts in actually obtaining this money from the supplier are fairly common and may increase the tension between the organization and the supplier. While several attempts to address the problem have been made, most of these fixes are reactive and do not actively force compliance. While rowing across a river or hiking around a ravine may get you across when a bridge is not available, they are not efficient. Similar to previous attempts at managing contract compliance, there is room for error and many challenges. As we are well into the digital age, Procurement technology has proven to be the most efficient and successful tool to turn negotiated savings into realized savings. Have you wanted to approach leadership at your company about making contract compliance a reality? Nitor wants to provide you with evidence to build a business case on why a commitment to contract compliance will be the best choice for your business in the long run. 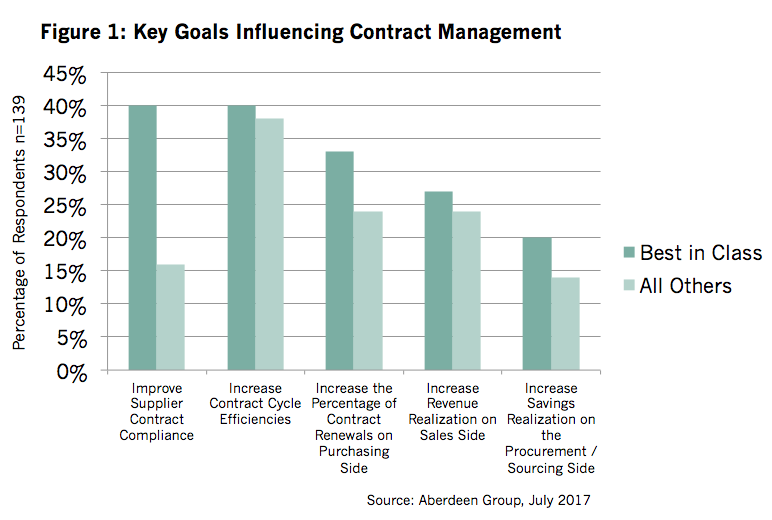 In a study conducted by Aberdeen Research on the goals of best-in-class organizations (defined by the study as the top 20% of organizations in regard to contract lifecycle management), contract compliance leads the list. These organizations recognize the value from understanding how a large amount of their spend complies with the pre-negotiated terms. Forty percent of best-in-class organizations hold contract compliance as a goal compared to only 16% of all other organizations. Most companies have significant opportunity available to them by focusing on contract compliance. These best-in-class organizations have measurable results proving that their efforts on improving contract management and compliance were valuable to the organization’s bottom line. Procurement’s main driver, savings, is significantly affected by these efforts. 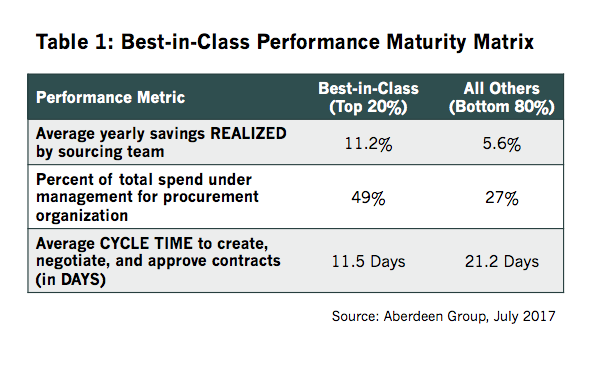 The chart below shows that realized savings are doubled for the best-in-class organizations compared to all other organizations. A popular component of a goods contract is tiered pricing. By linking contract terms to a catalog, users have access to purchase goods and services with the most updated pricing. For example, when the tier is reached, the catalog (now linked to the contract) is automatically updated to reflect the new pricing. This functionality allows for the organization to feel confident that associates buying from the different business units across the globe are purchasing with the correct pricing and eliminates the need to analyze the data after the fact. With tools, suppliers have the ability to invoice directly off contracts. Instead of just filing the contract in the drawer and forgetting about it, operationalize the contract and place it in the forefront for both you and the supplier. The supplier receives a copy of the contract and is able to flip it into an invoice. This ensures the line items in the invoices comply with the line items on the contract. Sourcing organizations will often renegotiate contracts with tiered and volume discounting as the result of having a procurement tool that has the ability to track and monitor those details. With an accurate view on the realized savings, the team can continue to extend the valuable contracts that the Sourcing team negotiates. Until recent years, ensuring that associates purchase against contract terms has continued to be a large gap within organizations. Businesses simply were too large, spread out, and complex to consistently enable enough visibility for individuals to take advantage of all negotiations or to monitor supplier performance in complying during invoicing. Now, with the advances of technology, organizations have access to platforms in order to bridge this gap and allow for greater realized savings than ever before. Ensuring different departments are able to work together and leverage each other through technology is an essential strategy toward Procurement’s main objective of delivering long-term, sustainable value to the organization.